For 150 years the YMCA has played an important role in Lynchburg, remaining relevant by adapting with the times. The Lynchburg association was organized in 1856 as a place where young men could attend Bible classes and gain work skills. During the Civil War, members volunteered to serve on the battlefield, delivering food, coffee, and medical supplies to the soldiers. The current YMCA would hardly be recognized by the generations of country boys who came to the city to seek their fortunes. In the early stages of their careers, many young men, including some of Lynchburg’s most prominent citizens, relied on the Y to provide them with practical training classes, hot baths, and inexpensive lodging. Sports offered at the Y have come in and out of favor over the years. Maybe your grandfather boxed for fitness while you took your first swimming lessons at a Y pool. The majority of women involved in the early Ys were part of “hostess committees” formed to help with fundraisers. Now many of the instructors and a great number of members are women. Along with women came the need for childcare which the Y has addressed very well. There was even a separate black YMCA with its own part to play in the history of the organization. As needs changed so did the buildings. 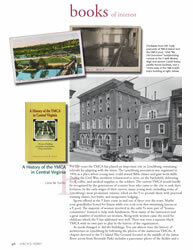 You can almost trace the history of architecture in Lynchburg by following the photos of the numerous YMCAs. A chapter devoted to the Y’s Island Play Ground (located in the middle of the James River across from Riverside Park) includes a panoramic photo of the facility and a postcard of the grand opening. Every era is nicely illustrated with copies of posters, brochures, fundraising letters, financial ledgers, and newspaper stories. But it is the photos with captions that are my favorite part of the history: the directors, the camps, the young men who spent all of their free time hanging out at the Y. If you have lived in Lynchburg for any length of time, some of the names and faces will be familiar. Memories will be stirred by pictures of the 1936 summer camp, the shoemaking class in 1941, the 1950s rumpus room, and the young weight lifters from the 1960s, including a fabulous muscle shot of Ham Sligh. This is a fun book to peruse and a very detailed resource for historians. Most people are intrigued by tales of lost treasure. Almost everyone who moves to Central Virginia eventually hears the tale of the Beale treasure. Just the thought of all that gold still sitting somewhere out in Bedford County stirs the imagination. This happens to match a description of Jean Lafitte during the same 1815–1820s time period. Furthermore, Lafitte supposedly buried a treasure near Galveston, Texas, that was never found. Could these treasures be one in the same? Was the Galveston, Texas, treasure just transported to Bedford, Virginia, for safety? Was Jean Lafitte the real Mr. Beale? Although Mr. Williams may not have all of the answers, at least all of the theories surrounding the case are covered in this book, along with the Codes, Beale’s version of the Declaration of Independence, and a copy of the papers that were entrusted to James Ward in 1862. In case you are inspired to do further research, a page of references is also included.